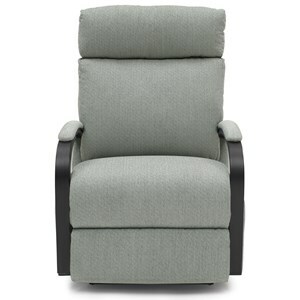 Bring both comfort and modern style to your home with this swivel rocker recliner. Features such as the slim, curved track arms help to create the modern design of this piece, while padding on the armrest and headrest add comfort. Complete with both swivel and rocking capabilities, this recliner will quickly become your favorite spot to relax. The Kinetix Swivel Rocker Recliner with Exposed Wood Arms by Studio 47 at Morris Home in the Dayton, Cincinnati, Columbus, Ohio, Northern Kentucky area. Product availability may vary. Contact us for the most current availability on this product.